Welcome to BrushBlazer.com, home of the Brush Blazer. The Brush Blazer is the most powerful walk-behind rotary brush cutter on the market. Our heavy-duty cutting deck has two discs with 6 flail blades that can mow down the thickest brush, including trees up to 6″ in diameter. The Brush Blazer is an easy to operate machine that fits in tight places and runs on slopes that a tractor mounted brush cutter simply can’t. Its unique combination of cutting power and compact size, allows you to replace an entire crew of men working with hand tools, at a fraction of the cost of commercial forestry equipment. 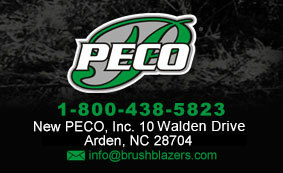 Built in Asheville, North Carolina out of 3/16″ thick steel and weighing just 1,200lbs, the Brush Blazer is the perfect machine for trail cutting, underbrushing, right-of-way maintenance, and fire abatement.